Over the past 10 years PIC has invested heavily in full-color digital printing technology to complement our silk screening capability. This was done as a response to increased demand for short-run work with enhanced graphics and variable data. The technology has enabled us to offer competitive pricing on this type of work which had been cost prohibitive using traditional printing techniques. In addition, digital printing allowed us to enter new markets such as signage and vehicle graphics. 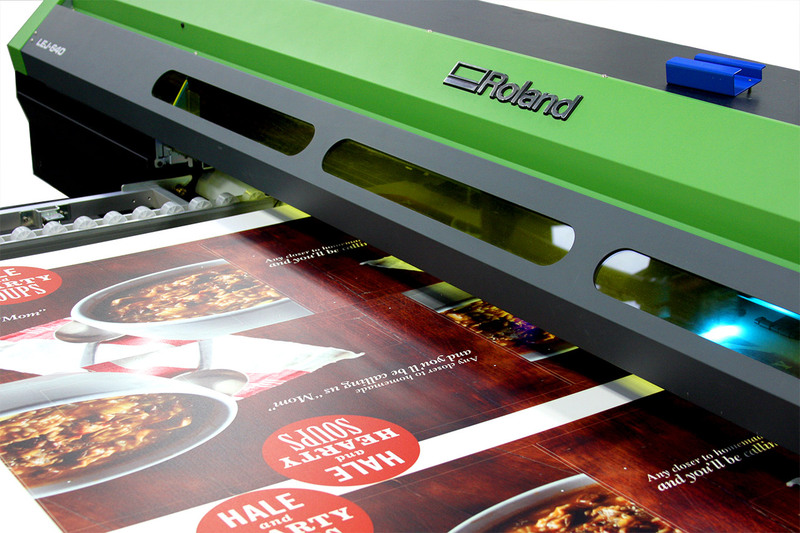 We currently own 3 Roland eco-solvent roll printers that can print a maximum width of 64”. We have the ability to print both white and metallic colors which is a capability that is uncommon in most machines. In addition to printing, these machines are also able to kiss cut pressure sensitive materials into any custom shape. The eco-solvent inks are outdoor durable and are primarily used to print on vinyl and other media that is coated to accept the inks. We are able to overlaminate the printed graphics for increased durability. The image quality is excellent (1440 x 1440 dpi at the highest setting) and is only limited by the quality of the print file we receive. We also have a Roland UV printer that is 64” wide and prints full-color plus white. This printer can print on just about any substrate up to ½” thick. The machine is hybrid which means that it can print on both rolls and flat sheets. As is the case with the eco-solvent machines, the print quality is excellent and the inks are outdoor durable.